It's not too often that I purchase new things & definitely not this often that they're this pretty! 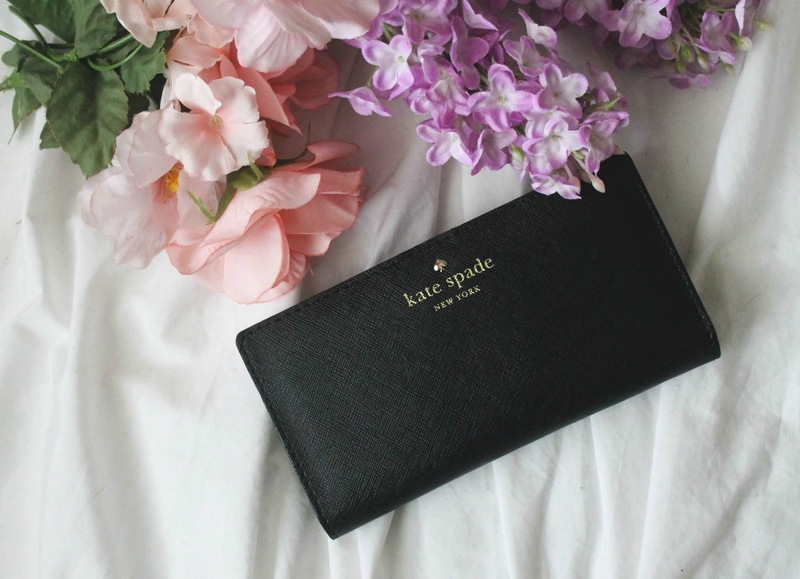 So, I wanted to share with you all my new Kate Spade wallet. I'd had my previous wallet for about a year and a half that I'd gotten from Claire's right before I traveled to Italy. As I traveled through Europe its bright robin's egg blue facade turned dark with dirt and my taste for over the top girly things started to subside. It got to the point recently where I was literally embarrassed to pull the wallet out because it was so worn and tattered. I knew the next wallet I got I wanted it to be a nice investment piece that I would still love over the years even if my style continued to change. 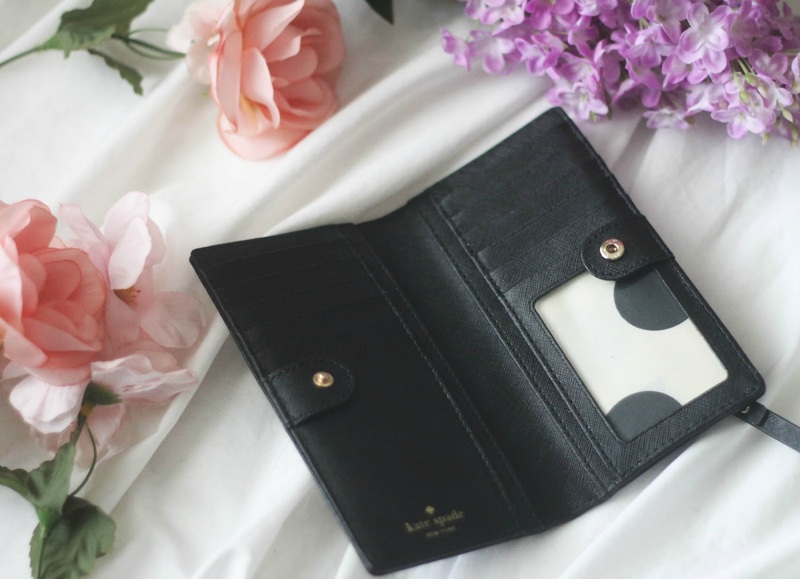 A few weeks ago I got an email in my inbox though that they were having a 25% off sale and so I scanned through the pages of wallets and fell in love with this Stacy wallet. Originally $100 even, the discount marked it down to $75 and although that's still an amount that's pulling tooth and nail for me to pay. I decided in the end it was worth it to get something I would like and would last me. I love the classic, sophisticated look of the Stacy wallet and am very pleased with my purchase. It's made out of beautiful, subtle cross hatched leather and I chose a solid black (although they have an array of beautiful, bright colors to choose from!). Initially I was a little disappointed with the style of the wallet. 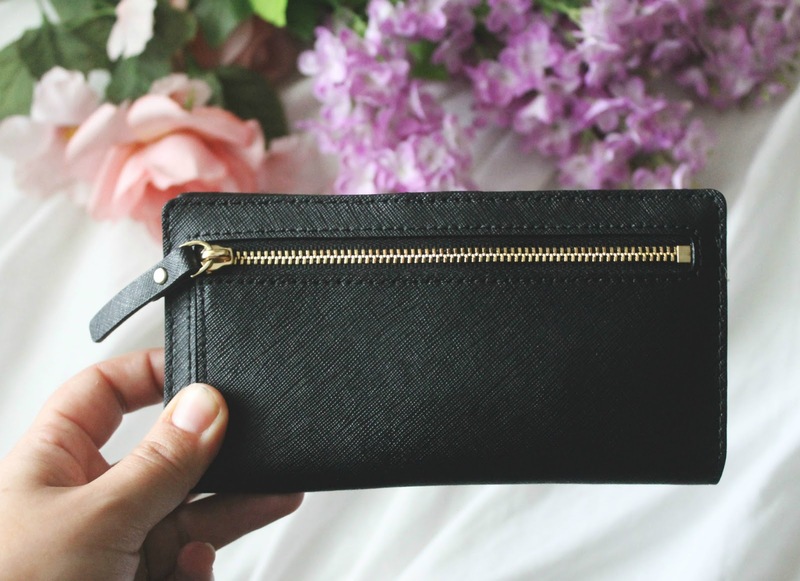 I was expecting it to enclose all the way around the edges and the Stacy just has a small button that hooks the two sides together; leaving the insides of the wallet pretty much visible. I was worried my cards would fall out and it just wasn't as sleek of a style as I had hoped, but I've grown to like it and ease of unbuttoning the wallet to whip out my card. The slots are very tight too, so no worries about cards slipping out! I will say though that this wallet is for those who carry lightly. I am not a big card owner (I have a student ID, license, credit card, goodwill card, and laundry card) and this is the perfect amount of cards for this wallet (it does have 12 slots though!). If you add a lot, it can get quite bulky. Same for if you tend to carry a lot of cash with you. As a young student I'm not carrying around a lot of cards or cash on me so this wallet is a perfect fit. I love it! I almost purchased a turquoise colored wallet from Kate Spade, but then my mom bought me a pretty cobalt wallet from Brighton. It's tiny and fits in the palm of my hand. 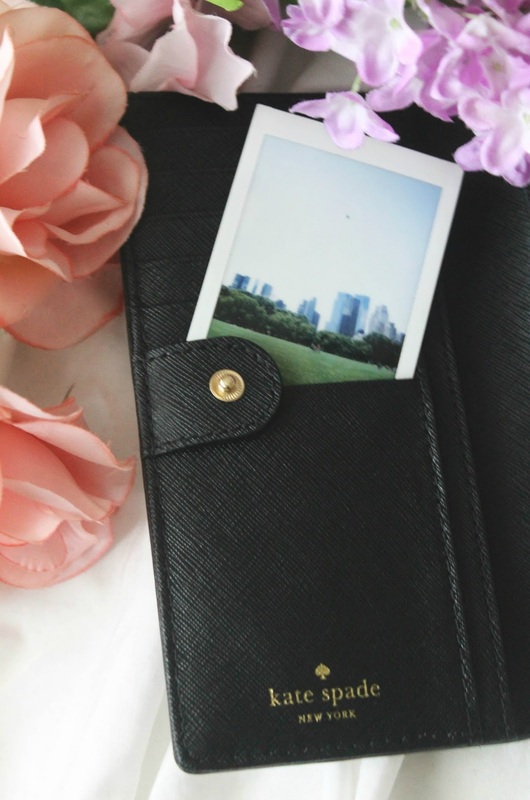 I like it because I can throw it in my purse, pocket, or gym bag easily. All it holds in my drivers license and atm card. A 17-year-old doesn't need much else, lol.